If you can’t do something yourself, there are always professionals at hand to do the job for you quicker and better than you can. That’s been the way for centuries, and it’s what the services industry has been built on. You can’t cut your own hair, can you? Even the most efficient housewives and house husbands can’t clean as well and as fast as a professionals can. So, if professional cleaners are that much better, how much better are they? We’ve analysed our cleaner’s productivity and output over the last three months to estimate just how fast and efficient they are. Using these two variables we came up with an average for the sq. ft. per hour our cleaning team can achieve. 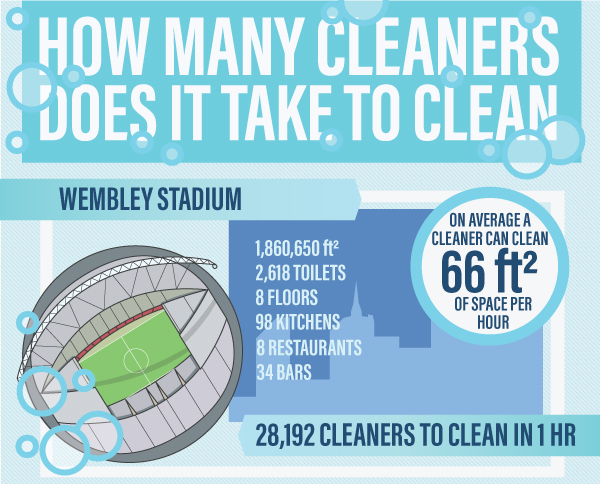 On average a cleaner can clean 66 ft2 of space per hour!!! Please include attribution to https://londoncleaningsystem.co.uk/ with this graphic.